A very strong, long lasting, solvent-free adhesive. Water resistant and can be painted or sanded. An equal amount of each part is required for full effect. Bonds metal, wood, masonry, ceramics, glass, leather, cardboard, fabric, rubber. 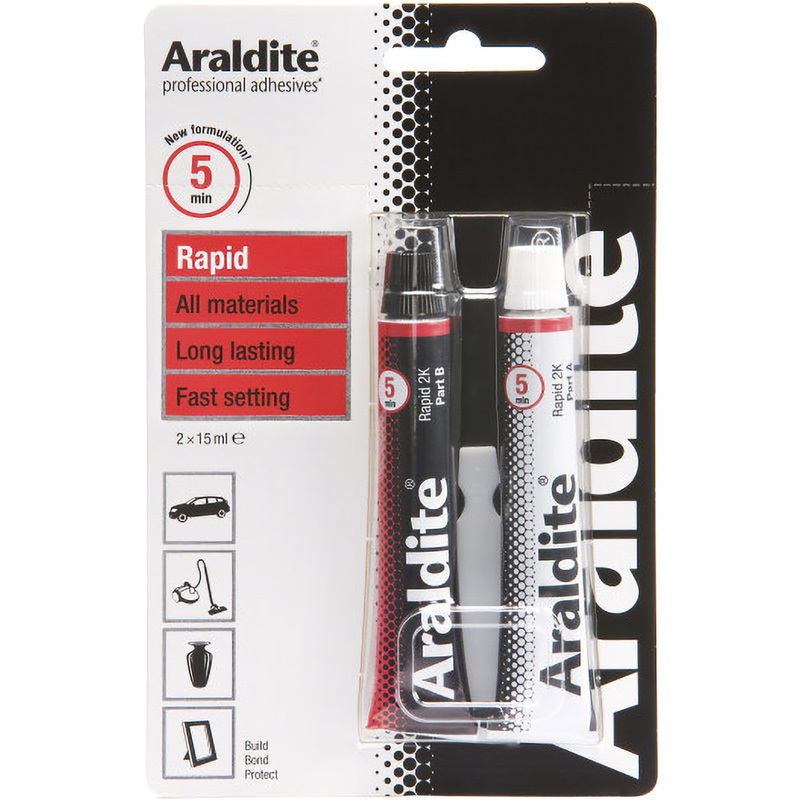 Araldite Rapid Tubes Epoxy Adhesive 2 x 15ml is rated 4.6 out of 5 by 8. Rated 5 out of 5 by Beagle from Well known product, works as well as it ever did Bought this for some light bonding work, does the job, as it has done since I can remember. Rated 5 out of 5 by Mhrp from Works so fast This sets within 10 minutes enough to handle and has gone off completely within a couple of hours. Gives a strong bond and is easy to work. Rated 5 out of 5 by Craggy from The go to glue Always keep some here,use it for adhesive,and other decorative features. Rated 5 out of 5 by Bolton boy from A quality adhesive at a very good price I bought this item as a standby for future jobs i have in the pipeline. Araldite is a time trusted and versitile product for many uses. Rated 4 out of 5 by Welwyntone from Great for small repair jobs I always keep a pack to hand for quick repairs to household items (and children's toys). Easy to mix and simple to use.